This superb vintage travel poster by Lucien Boucher is the highly collectible larger format edition of this iconic work, a masterpiece of its kind. The lithograph incorporates modern and antique map making elements and imagery, including angels in stardust in the four corners blowing into existence miniature earth-like planets. Myriad constellations are depicted, with the stars creating them and the figures after whom they are named all rendered. 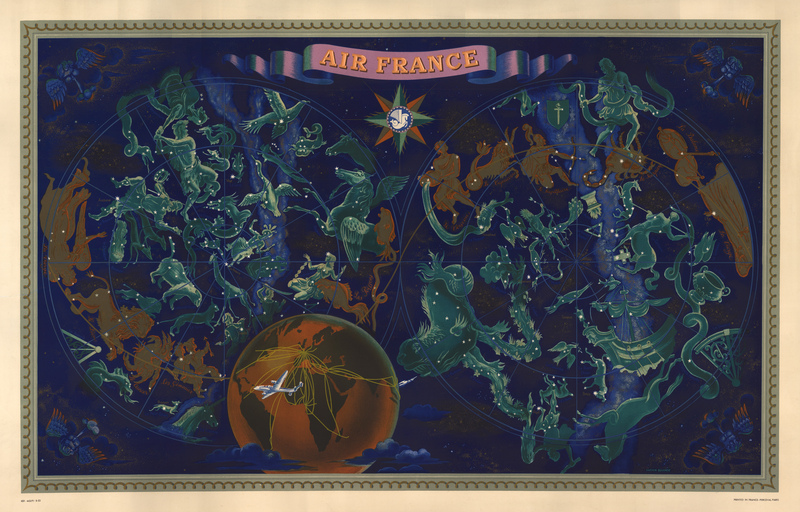 Superimposed over one area of constellations is a globe depicting most of the land masses, and crisscrossed by the routes used by Air France to a plethora of international destinations. The poster is a unique work of art. Condition: This vintage pictorial map/travel poster mounted on linen is in A+ condition.